LAS VEGAS -- Two sons of Nevada cattleman Cliven Bundy refused to attend, and several co-defendants shouted an oath of defiance at the end of a Friday court appearance for 17 men accused of conspiring and taking up arms against federal agents near the Bundy ranch in Nevada in April 2014. U.S. Magistrate Judge Peggy Leen decided not to order marshals to bring Ammon and Ryan Bundy to court by force, so the two Bundy sons remained in a nearby holding cell. Marshals were instructed to provide a speaker so they could hear audio of the court proceedings. Another defendant, Peter Santilli, blurted out that the Bundy brothers didn’t want to be shackled. Leen admonished Santilli that he didn’t get to speak on their behalf. So began a contentious three-hour hearing during which the judge didn’t make immediate rulings on a range of arguments, including the government’s request to have three trials and defendants’ requests to be tried together or in groups of their choosing. Trial is scheduled to begin Feb. 6. Leen called it “physically and logistically impossible” to try all 17 defendants together, and suggested it would be unfair for a 17th defendant to have to wait months or years to resolve his case if they were tried individually. She said she’ll issue a written scheduling order soon. Leen also is considering multiple requests to dismiss charges; a plea for a change of venue to Reno or another city; a suggestion that federal officials shredded documents that would be relevant to the case as they packed up and left temporary offices near Bunkerville; and Cliven Bundy’s lawyer’s insistence that the federal government has no jurisdiction in Clark County. Santilli’s attorney argued that he’s a journalist, and that his calls in Internet postings for supporters to rally to the Bundy ranch to lawfully carry guns and protest federal Bureau of Land Management action were constitutionally protected free speech. Santilli chimed in that he expected that when Donald Trump becomes president, he’ll intervene in the case on the defendants’ behalf. Several people among about three dozen family members and friends responded with words of love and support as they filed out of the courtroom gallery under watchful eyes of U.S. marshals. The protest-by-absence of Ammon and Ryan Bundy echoed the refusal by their father last March to enter a plea to federal charges that he led the tense armed standoff that stopped a government round-up of cattle on public land about 80 miles northeast of Las Vegas. A magistrate judge entered a not-guilty plea for him. No shots were fired, and no one was injured in the standoff. But images of Bundy backers with assault rifles on a freeway overpass forcing federal agents to back off in a dry river bed below have become iconic in an ongoing battle about states’ rights and federal authority. That dispute has roots a nearly half-century fight over grazing rights in Nevada and the West, where the federal government controls vast expanses of land. Calls for action have grown louder and more frequent in the Internet age, with bloggers protesting federal agency decisions to designate protected areas for endangered species and set aside tracts for mining, wind farms and natural gas exploration. The Bundy case defendants face conspiracy, obstruction, weapon, threat and assault on a federal officer charges that could get them decades in prison if they’re convicted. They and two others who have pleaded guilty in the case remain in federal custody in southern Nevada. Federal prosecutors want three trials, with the first to start Feb. 6 for accused conspiracy leaders Cliven, Ammon and Ryan Bundy, Payne and Santilli. 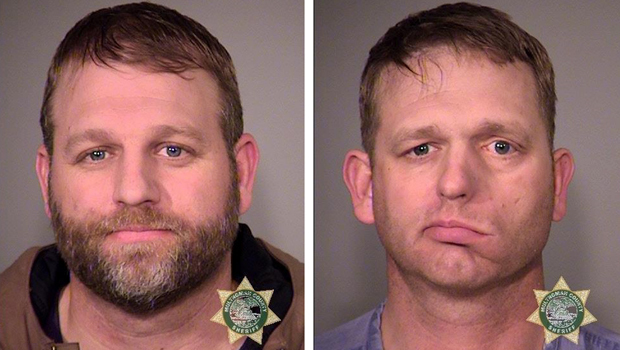 A second trial would start in May for six alleged “mid-level” standoff leaders and organizers: Bundy sons Dave and Mel Bundy, Brian Cavalier, Micah McGuire, Joseph O’Shaughnessy and Jason Woods. A third trial would begin in August for six accused “followers and gunmen.” They are Gregory Burleson, O. Scott Drexler, Todd Engel, Ricky Lovelien, Eric Parker and Steven Stewart. Woods’ lawyer, Kristine Kuzemka, protested Friday that labeling defendants as “gunmen” is unfair because it suggests guilt or culpability. Leen said a description used for now, during pretrial proceedings, might never be suggested to a jury. Burleson’s attorney, Terrence Jackson, asked again for the judge to consider releasing his client before trial for medical reasons. Jackson said Burleson, 53, of Arizona, is blind, diabetic and uses a wheelchair. Burleson told Leen he isn’t getting medical treatment in federal custody. “I don’t want to end up dying in here,” he said.